When Darold Imanaka took over the girls basketball program at Kalani, he didn't just step in. Imanaka dove in, head first. His philosophy embodies elements of his passion for the game and the community. He introduced halftime promotions to Lady Falcons home games. On the court, he instilled a run-and-gun tempo, using a fullcourt press to put more action, more possessions and more excitement into Kalani basketball. More recently, the Lady Falcons traveled to play in Konawaena's Wahine Wildcat tournament. There, as he has throughout the nonconference schedule, reserves played equal minutes with the starters. It's the same approach he had through Kalani's rise to the Division II state title last year. Konawaena, which is ranked No. 3 in the Star-Bulletin Girls Basketball Top 10, beat Kalani 49-44 in the tournament. The Falcons, who knocked off Iolani and Punahou recently, are ranked No. 4. The Interscholastic League of Honolulu made a rare allowance this season, and at least two schools are happier for it. La Pietra petitioned the league in the offseason, requesting to remain in Division II girls basketball. The reason was obvious: the Lady Panthers didn't have the manpower after a senior-heavy class helped the squad win the ILH D-II title last year. In addition, top player Courtney Gaddis transferred away to Kalani. The ILH granted the school its wish. Also, Sacred Hearts finally made a move down to D-II, a move that pleased longtime coach Alan Matsui. Now that they're in D-II, where the school's softball program has been in recent seasons, the Lancers have a real shot at qualifying for the state tourney instead of the annual steep uphill battle to defeat the ILH's perennial Division I powers. 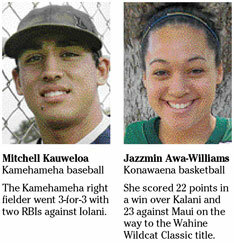 The Kamehameha right fielder went 3-for-3 with two RBIs against Iolani. She scored 22 points in a win over Kalani and 23 against Maui on the way to the Wahine Wildcat Classic title. » J.R. Bunda, Iolani: the sophomore hurler allowed just three hits in more than 6 innings as the Raiders edged Saint Louis. » Kenny Ellis, Kailua: went 3-for-3 with a double and two RBIs against Aiea. » Case Miyahira, Iolani: went 2-for-4 with a double, two RBIs and two runs scored in a win over Kamehameha. » Preston Nakata, Kailua: went 2-for-4 with two doubles and two RBIs against Aiea. » Nicole Fu, Maryknoll: scored 20 points, including the winning basket with 12 seconds left, in a win over Farrington. Scored,16 points in a win over Waimea. » Courtney Gaddis, Kalani: scored 18 points in a victory over Maui. » Whitney Hirano, Pahoa: scored 27 points against Parker. » Keisha Kanekoa, Honokaa: led the Dragons to the Hilo High Classic title and was named MVP of the tourney. » Rayleen Naki, Keaau: scored 20 points in a win over Kohala. » Whitnee Souza, Parker: had 22 points against Pahoa. » Vicky Tagalicod, Hilo: scored 26 points, including 14-for-17 shooting at the free-throw line, in a win over Waiakea. » Milika Taufa, Lahainaluna: scored 16 points in a win over Kealakehe. Added 22 points in a victory over Aiea. » Dara Tompkison, Punahou: had 14 points and seven steals in a win over Waimea. » Analee Viena-Lota, Kamehameha: scored 21 points in a win over Lahainaluna. » Sean Maekawa, Honokaa: carded an 8-under 64 in the first Big Island Interscholastic Federation event of the season at Waikoloa Village. » Tammy Surtees, Hawaii Prep: posted a 1-under 71 to lead the girls at the BIIF event at Waikoloa Village. » Aja Kusao, Iolani: scored six goals to lead the Raiders over Pac-Five. >> Jade Look, Iolani: scored five goals against Pac-Five.